The past 4 weeks have been absolutely crazy! And I mean really crazy!! 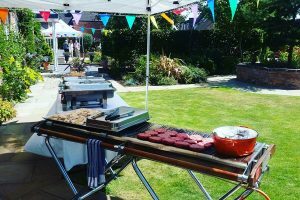 I haven’t stopped… busy providing outside catering to a whole host of clients all over Derbyshire. I’ve catered canape parties, dinner parties, Corporate events, BBQS…. the list goes on! 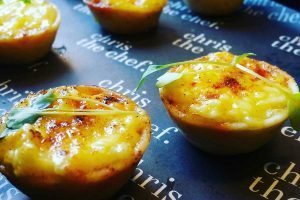 If you set yourself up to do outside catering, I’ve found that you must be prepared to cater to not only the client’s tastes, but also the client’s needs. That is what makes you stand out. At the start of July, we catered a 65th birthday party with a whole array of canapes at a beautiful house in Quarndon. We provided a whopping 16 different types; all of which were handmade, and all went down a treat – the feedback has been outstanding. 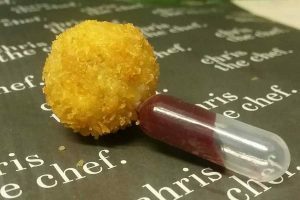 Some of the canapes that we did were ‘Braised Ox Cheek & Saukraut Croquettes with white bean puree’ and ‘Goats cheese Bon Bons with Beetroot & Port Gel’. We also served ‘Mini Yorkshire Puddings filled with Beef Fillet & Horseradish’ and ‘mini Fish & Chip Cones’. Planting Group called Act29. This was the Churches annual board meeting and guests came from all over the world to attend. On one of the nights they requested a BBQ which we provided some local award-winning steaks from our Butcher, Owen Taylors. It was only 5 minutes before I lit the charcoals that a few of the guests let me know they were all from Texas and the home of BBQ! Needless to say, they were over the moon with things, loved the steaks and even asked if I would go to America for their next board meeting to cook again…Of course I said yes!!! Hopefully it’s the start of some outside catering across the pond. We have also been at some beautiful holidays cottages run by the amazing Peak Venues where we have met some lovely clients from all over the UK. 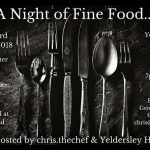 With a busy few weeks ahead of outside catering, I’ve also had to fit in time to write menus for next year, meet brides that are getting married at Yeldersley hall next year and beyond, as well as planning my pop up restaurant in November. Things are really starting to pick up and I couldn’t be more excited for the future. Hopefully, catering for dinner parties, weddings and private events around Derbyshire is going to be as exciting as the past 2 years have been for me.